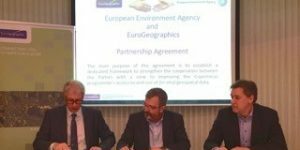 Users of Copernicus services are set to benefit from a new partnership which improves access to pan-European maps and land information from official sources. 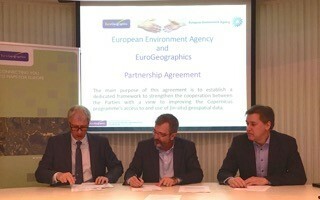 The cooperation agreement signed today (29 March) between the European Environment Agency (EEA) and EuroGeographics signals a commitment to make more national authoritative geospatial information available through the European Commission’s flagship initiative for earth observation and monitoring. To improve Copernicus access to EuroGeographics data and services, produced using official geospatial data from its members. To enhance the dialogue between Copernicus and EuroGeographics members. To foster knowledge exchange between Copernicus and EuroGeographics members. To promote awareness raising activities. To support initiatives to provide pan-European harmonised data services. To facilitate coordination and communication between the two organisations, EuroGeographics is establishing a dedicated knowledge exchange network to share expertise and experiences. Feedback from the EEA will also provide invaluable input into the delivery of future European Location Services which are being developed by EuroGeographics and its members. The vision is that these will provide the single access point for international users of harmonised, pan-European, authoritative geospatial information and services; and enable national mapping, cadastral and land registry authorities to be recognised in their international effort to contribute to the wider public good. 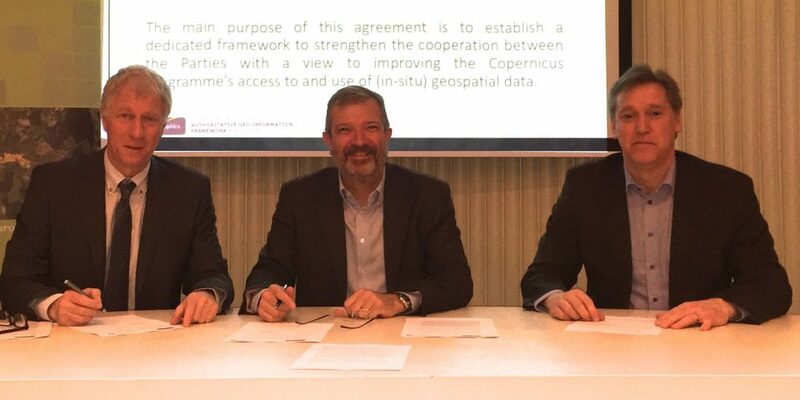 Dr Hans Bruyninckx, Executive Director, EEA (left), Mick Cory, Secretary General and Executive Director, EuroGeographics (middle) and Anders Sandin, Chair of the EuroGeographics Copernicus Knowledge Exchange Network (right) at today’s signing.